DTIB University offers product trainings and associated quizzes for training on our drug testing products. 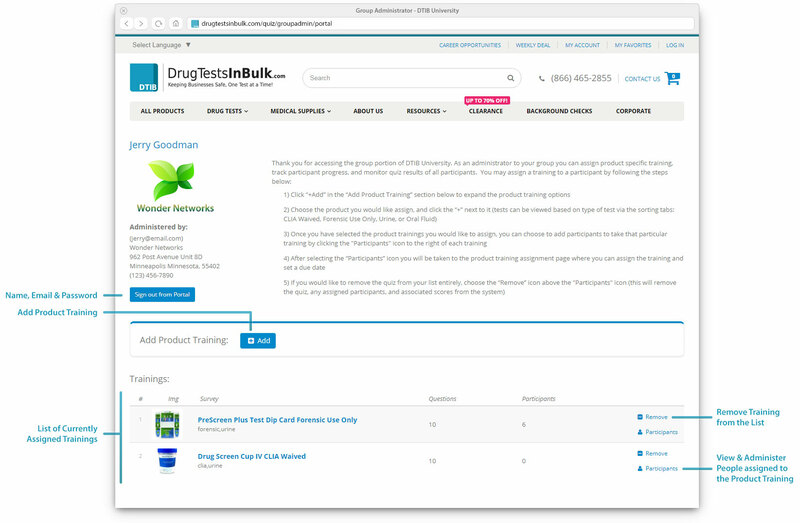 In addition to training, our Group Administrator portal allows an individual to assign product trainings and quizzes. The Group Administrator can also view progress and monitor quiz results. To request Group Administrator capabilities, you must first register as a Group Administrator. After you submit your request, our team will review your application. If approved, a confirmation email will be sent with a link taking you to your custom portal. To register as Group Administrator, fill in required fields, validate captcha, and press Submit. 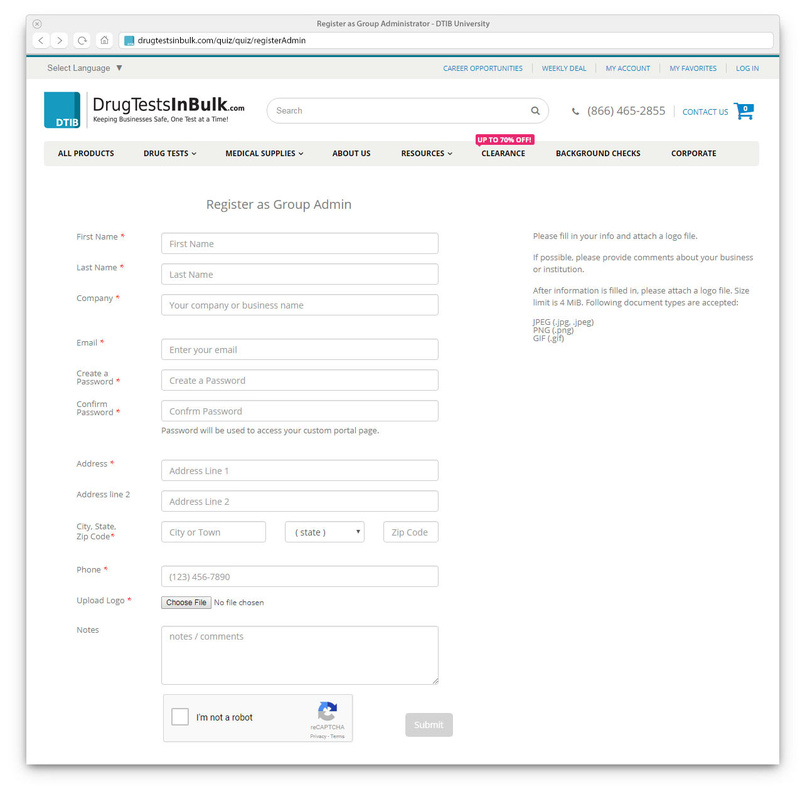 After registration and approval, you will receive a link to your custom Group Administrator Portal. There will be a button to add a Product Trainings, and a list of currently assigned product trainings. To begin adding Product Training(s), click on «+ Add» button to open the list of available trainings. Trainings are categorized by product type, FDA/CLIA status, and specimen type. If you do not know what training(s) to select, you have the option to view by product model number. Simply hover over the products and full list of model numbers associated with that product will appear. 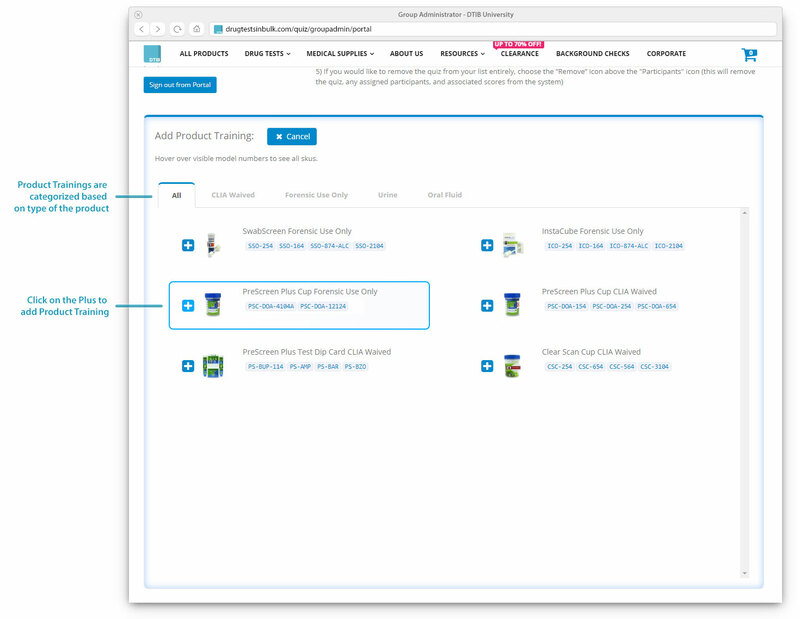 Add a training by clicking on a "plus" button next to product picture. After you have added a Product Training(s), it will appear in your list. 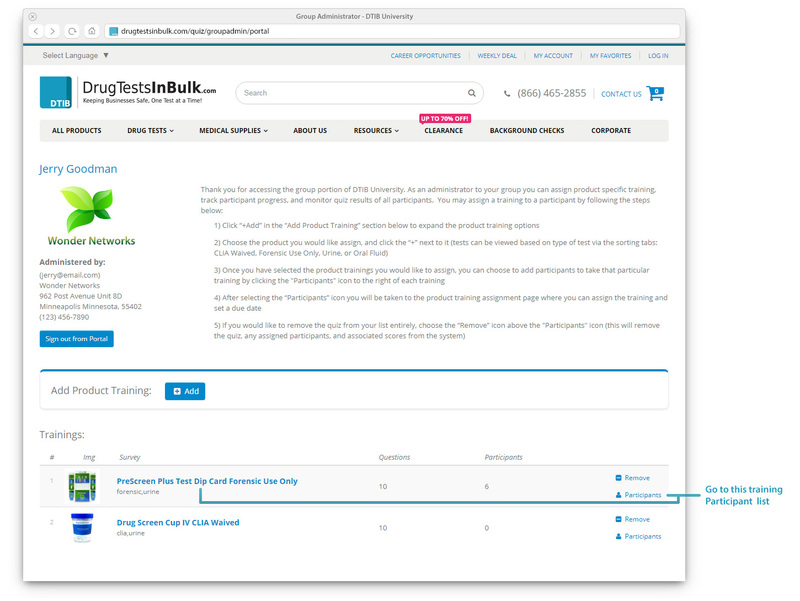 Click on either the training name link or Participants button to the right of the listing. 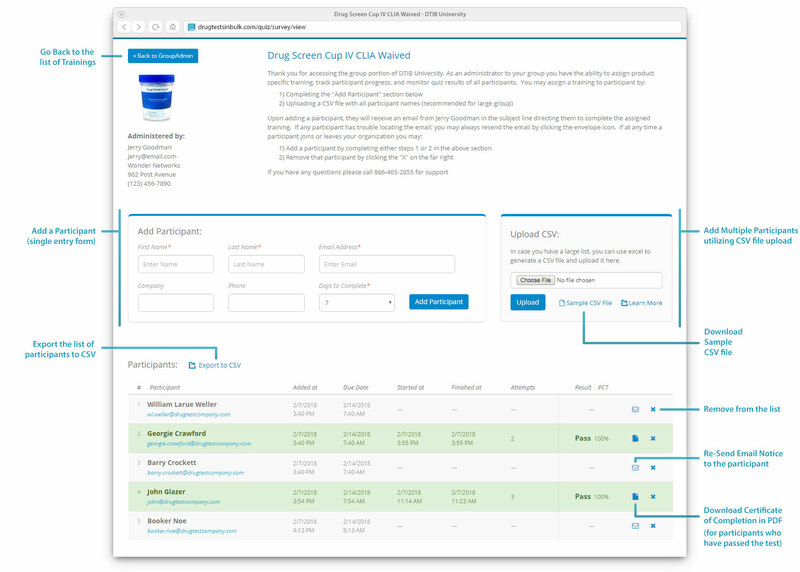 You will be taken to the Product Training Participants page where you can add, remove, and manage participants. There are two ways to assign new participants: using the single-entry form or by uploading a CSV file with the required information. To add participant using single entry form — at minimum, fill in fields that are marked with red asterisk (*) and click on «Add Participant» button. Note the "Days to Complete" field defaults to 7 days. This field sets the participant’s required completion date for the training & quiz. The participant will receive a reminder email daily until the training & quiz are complete or the due date has passed. If you would like to add many participants, you may utilize the upload CSV form. Download the Sample CSV file and use it as a template in Excel to enter at minimum, the participant names and emails. Save the file in Excel and upload it by clicking on "Choose File" button. When you click the "Upload" button our system will add participants listed in the CSV file. Every time you add a new participant, the system will send them an email with a link to the product training(s) and the appropriate quiz. The system will continue to send notices daily until the participant completes the training or the due date has passed. Upon successful completion of the quiz, the corresponding row will become green and the quiz results will be shown. The Re-Send Email Notice button will be replaced by a Download Certificate button, which will allow you to download participant's Certificate of Completion.